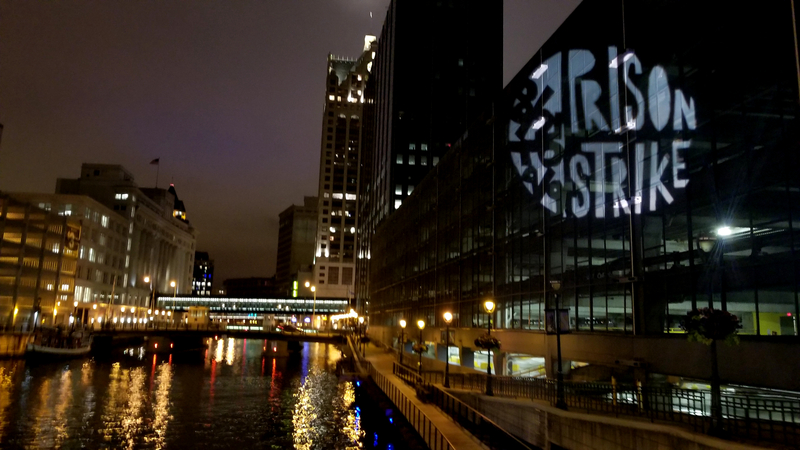 Report from Milwaukee on recent solidarity actions in the lead up to the #PrisonStrike. 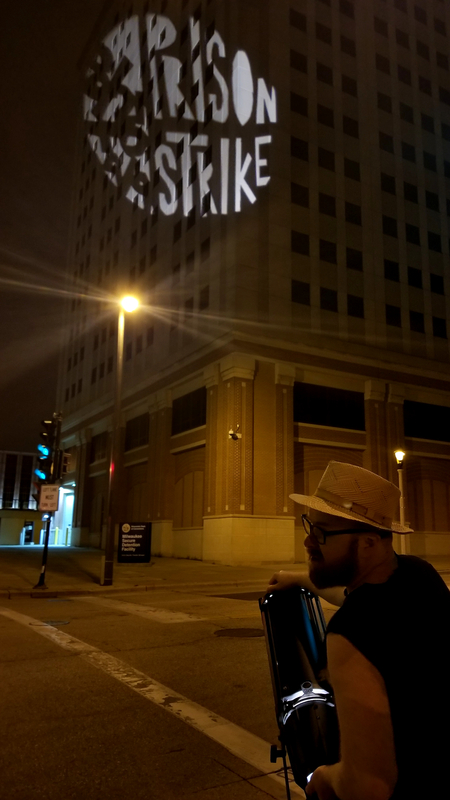 In Milwaukee we participated in the prison strike’s week of support by doing a bunch of sweet work. First we jump-started the week by getting weird and wild at Bastille Days. Then on Wednesday we deepened our networks and ideas with a General Assembly. Finally we wrapped up with two nights (July 20+21) of projecting the strike dates over the masses departing from fireworks displays. All through the week we augmented these efforts by posting hundreds of fliers and stickers around town. Milwaukee loves festivals and fireworks. Most weekends all summer long there’s one fest or another downtown, and they often end the night with a fireworks display. 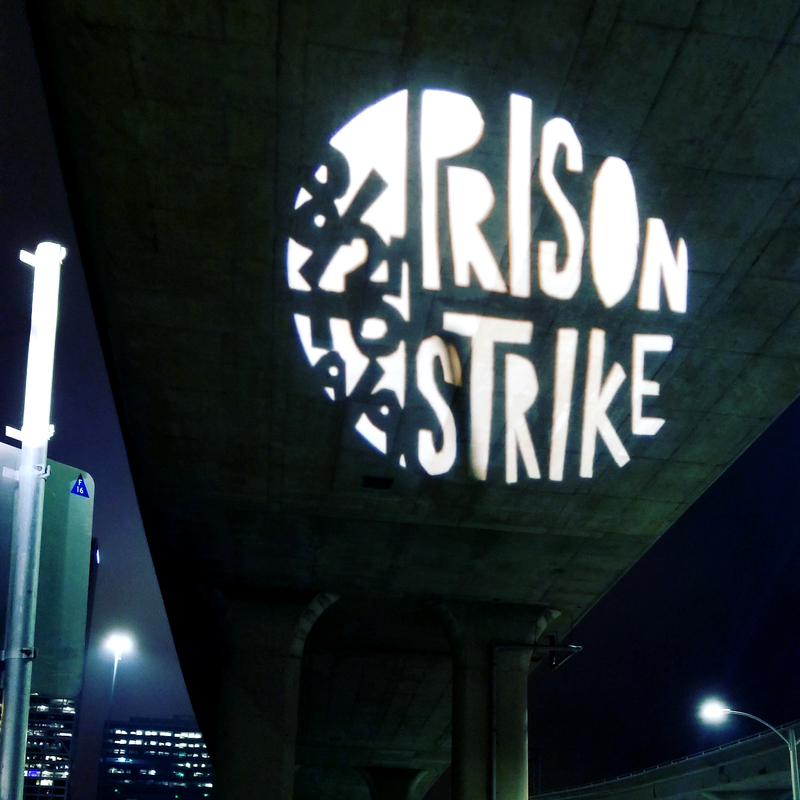 This weekend, we went out two nights in a row with a special stencil cut for the prison strike and our borrowed spotlight rig. The first night we shined it on a parking garage overlooking the main freeway spur that people departing festival park would take. Clouds and rain in the forecast that night reduced fireworks viewing and thus traffic for our action. The next night, similarly overcast, we took the spotlight right up to the park gates and shined it onto the underside of the freeway bridge to maximize impact. This also allowed us to hand out fliers with the striker’s demands on one side and information about #CLOSEmsdf (a campaign to close the local highrise prison) on the other. By asking passersby, “do you know about the prison strike?” and encouraging them to “help end slavery in america” we normalized the idea of prisoners going on strike. Many of the festival-goers were profoundly uninterested drunk suburbanites, but others were surprised and excited by the prospect of a strike in prison. A few people with loved ones inside, or who had done time themselves, shared their stories with us and vowed support. Some people just found the spotlight novel and took photos to repost on their social media accounts. Both prior to and during this week, we recognized the challenge of getting turn-out for street demos during the brief months of hot sunny weather in Wisconsin. So, we instead focused on actions that create high visibility without depending on large numbers of participants. This focus had the additional benefit of allowing flexibility and practicing affinity-group decision-making in a radical community more used to mass organization dynamics. We sent press releases out for each of our excursions, but did not achieve the desired goal of newspaper or television coverage, the safest way to get word past Wisconsin’s especially strict mailroom censors. Looking forward, we have many plans for continued efforts to make the strike impossible to ignore. 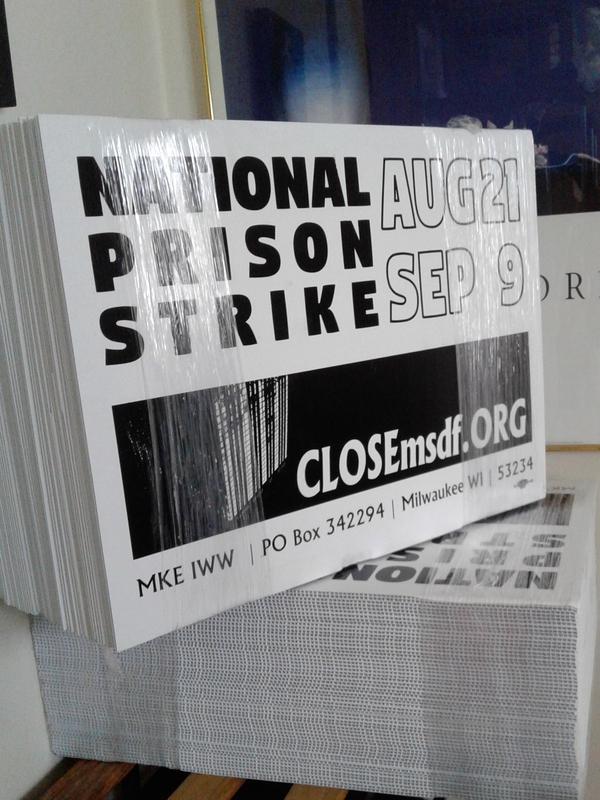 Inspired by Floridian’s solidarity with Operation PUSH we bought 100 yard signs that we’ll post up near prisons and distribute to friends in Milwaukee’s police-saturated neighborhoods. Next week, on the first day of Wisconsin State Fair we will be having a day long visibility action at MSDF. We’ll hang banners over the freeway, march around downtown, hold a third strike support general assembly, and pickets outside the county courthouse and the State Office Building where parole and probation officers cycle people from the streets back into the prisons. After that, we’ve got a history event in the works on prisoner resistance with Reggie Jackson, renowned griot from America’ Black Holocaust Museum. By combining high visibility actions, coalition work with existing community organizations, and public speaking events we hope to build a broad and robust strike response, whether or not Wisconsin prisoners learn about it and participate.